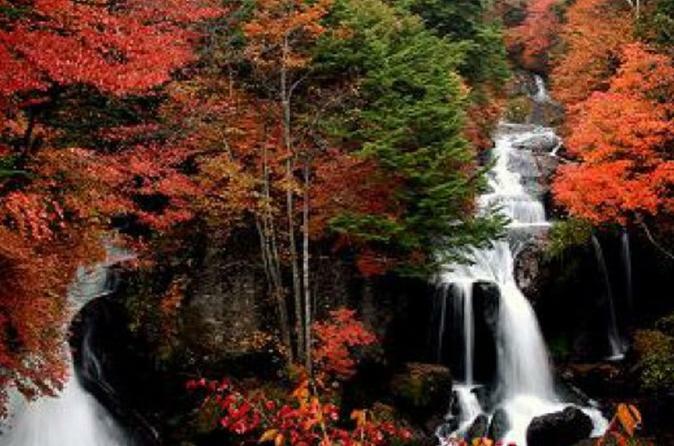 Enjoy the amazing autumn leaves at 3 breathtaking waterfalls and other wonderful natural scenery in Tochigi on this day trip from Tokyo. The tour visits, in order, Kegon Falls, Ryuzu Falls and Yudaki Falls, all with their own unique features, which will look even more special with the dazzling display of red, gold and yellow leaves serving as a backdrop. Look foward also to viewing stunning landscapes out of the window in between bus journeys of Irohazaki, Lake Chuzenji, Senjogahara Marshland and Konsei Mountain Pass. This tour only runs on selected dates in October so places are limited! Depending on the day of your tour, depart Tokyo at 7:00 or 7:30 and get ready for a day celebrating the wonderful nature on offer in Tochigi Prefecture! The tour kicks off by visiting Kegon Falls, the first of the trio of waterfalls included in the itinerary, but before reaching the location, rest up in Nikko after the long morning drive. Then, sit back and relax on the coach again as it winds its way through the Irohazaki road which connects central Nikko on the lower ground with the Okunikko region on higher ground. The 48 hairpin road and the driver's skill is impressive enough, but it will be surrounded by autumn foliage at this time of year to give it an added wow factor. Soon enough, you will arrive at Kegon Falls, which is considered one of the three greatest waterfalls in Japan amd is a leading tourist attraction in the whole of Nikko. Feel the sheer force of the water as it drops 97 meters against the autumn color backdrop. Enjoy the spectacle from the observation platform or, for a closer look, ride an elevator for an additional JPY550 (depending on congestion on the tour day, there is a possibility that you will not have enough time to ride the elevator.) The tour will spend an hour here. Pop back on the bus as it heads to waterfall number 2, Ryuzu Falls. On the way there, the bus will go past the beautiful Lake Chuzenji, the source of Kegon Falls, which will also be surrounded in autumn foliage. Ryuzu Falls is also known as "Dragon Head Falls" by its shape resembling a dragon's head when the 200m waterfall splits into two falling streams at the bottom as it flows over a large rock. The image of a dragon is particularly strong during autumn when the fiery reds and crimsons of the trees remind visitors of the fire-breathing creature. The tour wil spend half an hour here. En route to the final waterfall, Yudaki Falls, the bus will pass through Senjogahara Marshland where the grass and larch trees will display a reddish-brown and gold color which carpets the plateau creating yet another pleasant landscape. At Yudaki Falls, what strikes you immediately is the scale and power of the waterfall falling from a height of 70 meters and 25 meters wide. A unique feature of this waterfall is how the water spreads out like a fan as it cascades down. The tour will spend half an hour here. Afterwards, the tour makes its way to Numata in Gunma Prefecture via the Konsei Mountain Pass boasting yet more gorgeous scenery which you can enjoy from the window. At Numata, you can enjoy shopping for half an hour and a good chance to purchase gifts and also dinner to have on the journey back to Tokyo. The tour ends between around 19:40 upon arriving back to Tokyo.